Searching for the right vocal tone can be difficult, but it doesn't have to be. Getting the right signal chain setup is the most important part of the process. Now you could just use any microphone you have on hand, but you do need to consider the quality of the mic in relation to what you will be recording. Most podcasts are done in a narrative style and that does require a certain amount of clarity. Listeners need to be able to understand what your saying without the interference of background noise. To achieve this tone quality, you need to use the right mic and preamp. Condenser mics seem like a reasonable choice because they work so great with vocals on songs. However, they tend to pick up room noise during tracking, so your room need to be quiet and properly treated for reflections. You could put your head under a blanket, but who wants to do that for every podcast? So maybe a condenser mic isn't the best choice. Dynamic mics are great for getting that boomy radio voice. You can get right up on them and induce the proximity effect for the desired depth and presence that you want. Still, there are drawbacks to using a dynamic mic. The input signal is always too low, so you wind up cranking the preamp. This induces noise from the amp and that can sound harsh and unpleasant. So you get closer to the mic to increase the signal, but now you have a lot of plosives to deal with. This forces you to use a pop filter and now you're back to a weak signal. Here's the solution. Get yourself a Cloudlifter. If you've never heard of the CL-1, then you should acquaint yourself with this little device. 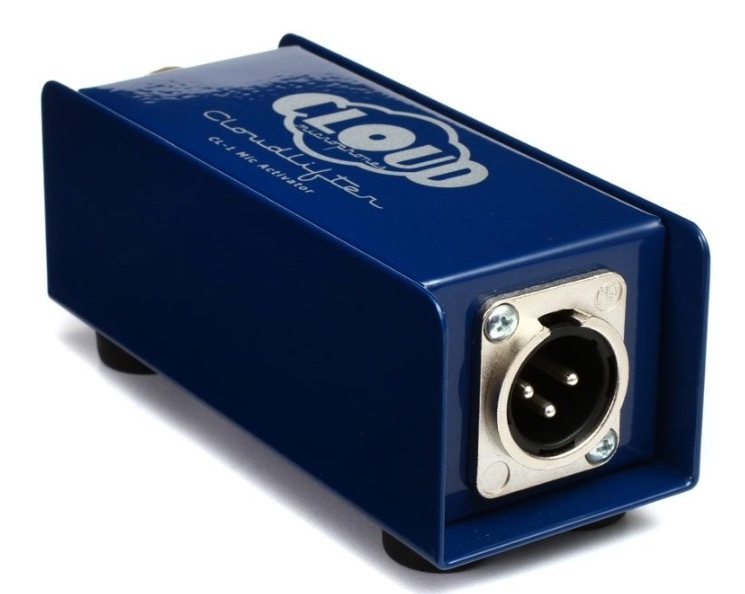 This little blue box will elevate your dynamic and ribbon mics with +25dB of input gain without the amp or background noise. You just put it in the signal chain and send it 48v phantom power. The beauty is that the box doesn't send the phantom power to the mic. This way it's safe to use with ribbon mics and gives them the needed boost to provide you with a solid input level for your recordings. I found you some options for buying a Cloudlifter box. You can go with the CL-1 for $149. This is great if you just have one mic and want to buy just what you need. However, if you plan on doing interviews or having a guest speaker sit in the studio with you, it's a great idea to get a CL-2. This is a 2-channel Cloudlifter box that will give you the same quality. The best part is that the channels are separate, so you can use one or both at a time. The link I found will also get you a couple of mic cables included in the price. Now the mic you're using is still a variable, so leave a comment with the mic you're using and we can discuss more details about getting the right tone for your voice and podcast. Newer PostMixing with Headphones - Which Ones to Use?